Continuing the trend of call-ups from the 2014 MLB Draft, Trea Turner joins in on the fun with the Washington Nationals. While there aren't a ton of cardboard options, collectors have multiple choices among Trea Turner prospect cards. After playing high school baseball in Florida, Trea Turner made the move to North Carolina State University despite being selected in the 2011 MLB Draft. At NC State, Turner showed his impressive ability and emerged as one of the top players in the country. This success led to him being the 13th overall selection in the 2014 MLB Draft by the San Diego Padres. Turner would not even last one season with the Padres before being traded Washington Nationals late in 2014. Because he was traded during his first season, he actually had to wait until June of 2015 to actually join the Washington Nationals. After that, it did not take long to get the call and the Nationals are counting on his bat to help revive their offense. 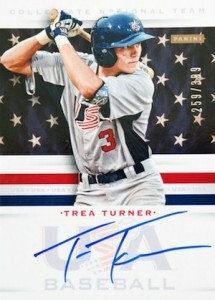 Although his pro career did not kick off until 2014, Trea Turner's cardboard career began in 2012 thanks to his participation with USA Baseball. Collectors can find multiple card options from both 2012 and 2013. Because he was drafted in 2014, collectors can find the most choices from that year. It is important to note that all his pre-rookie cards feature him with the Padres or USA Baseball. While Trea Turner's promotion means that his official rookie cards are not that far off, collectors don't have to wait at all to start collecting his cards. Several key prospect cards for Turner are highlighted below. The list offers a mix of options across all budgets and a focus on hard-signed content. Part of the earliest card options for Trea Turner, the young stud first enter the collecting world as part of USA Baseball. 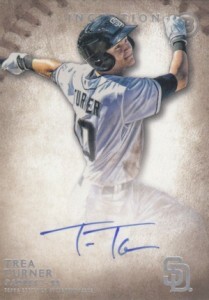 Turner has several signed cards from 2012 but the Collegiate Marks insert stands out with the bold design and gold ink. The print run of just 100 makes it even more appealing. 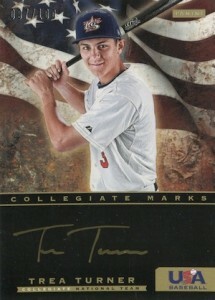 Another key USA Baseball autograph for Trea Turner came the following year. The simple design and moderate print run make it an affordable early release that still meets the criteria for a top card. 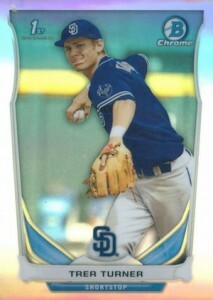 Like most prospects, Bowman is king and tends to be a popular option even after the rookie cards are released. 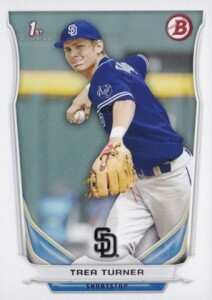 Turner was included in 2014 Bowman Draft as part of the Draft Picks base set. There are also Chrome parallels, but neither base version will set you back too much. 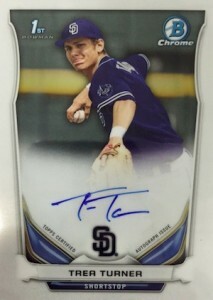 Easily his most popular card to date, the Chrome Draft Picks Autograph for Trea Turner is also found in 2014 Bowman Draft. Like the base Chrome card, a variety of Refractor parallels add to the totals. 2012 Panini USA Factory Sealed Baseball Set Kris Bryant Trea Turner AUTO ? ?